Jampacked with excellent content, Hulu is slowly becoming one of the go-to video streaming services in the US and Japan. So, what happens when you want to watch a show on Hulu, but the service is unavailable in your country (you need a fix for the Hulu proxy error)? You find a VPN. While Hulu is restricted out of the US and Japan, a good VPN can bypass the restrictions allowing you access to Hulu. All you need to do is to find the best VPN for Hulu. The VPN provider offers several servers that make your IP address look like it is accessing the site from a different country or location. The VPN provider will also complement your Hulu subscription allowing you to watch your favorite shows wherever you go. But that is not everything the VPN service provider does – they will also free you from the potential burden of ISP throttling resulting in an increase in your internet loading speeds. It should be noted; however, that very few VPN providers will deliver Hulu to your screen. 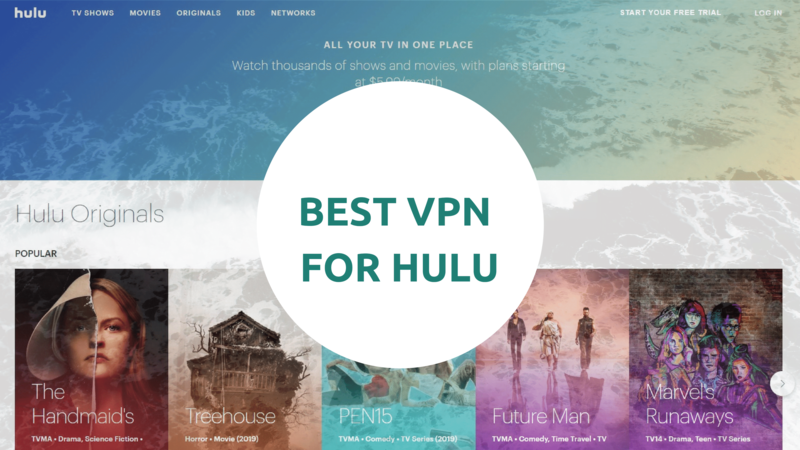 How do you choose the right Hulu VPN? NordVPN is a highly ranked VPN provider, and it offers the most secure streaming service. Its performance is exceptional thanks to the high number of servers. NordVPN is one of the VPN services with over 5000 servers; it currently has 5116 servers in 62 server locations – 1920 of these servers are located in the US, and 65 are in Japan. This big number of servers is the reason why NordVPN offers fast performance. The download speeds are also quite high. This VPN also offers custom apps for the major platform and devices, as well as tutorials for manual setup. However, the most interesting feature has to be the Smart Play feature, the secure proxy used by NordVPN to bypass geoblocks set up by the streaming service. Smart Play is on by default, and you don’t have to follow many steps to watch Hulu. Regarding security, NordVPN is, without a doubt the most secure VPN provider thanks to its 2048-bit encryption, as well as the option of encrypting your IP/ internet traffic twice on the selected servers. The VPN provider also offers DNS leak protection, a kill switch, as well as ad & malware blocking. To top it all, there is the ‘no logs’ policy that protects your online activity. In case of trouble, you can reach the customer support team via chat or email, 24/7. If you doubt their services, you might like their free –day trial and the 30-day money back guarantee. Otherwise, the monthly and annual rates are affordable. Regarded as an all-around, ExpressVPN boasts over 2,000 servers spread out in 148 locations. While it is not the cheapest VPN provider, it offers top-notch performance, and it supports a wide range of devices. The devices supported include Mac, Windows, Linux, IOS, and Android; meaning that you can use this VPN on your PC, desktop, smartphone, or tablet. But that is not all: ExpressVPN comes with the MediaStreamer DNS feature which will unblock Hulu on devices that do not support the service like Apple TV, Game Consoles, and Smart TVs. As one of the top-rated VPN providers, ExpressVPN will deliver Hulu to an above-average speed for streaming HD quality content easily. Its connections are also super stable, and the bandwidth is quite sufficient when it comes to streaming Hulu or any other video streaming service. The other impressive feature of ExpressVPN is its tight security that is delivered through superior security features like the 256-bit AES secure encryption, a kill switch, DNS/IPv6 leak protection, as well as split tunneling. There is also the fact that your data gets the highest level of privacy since the company does not keep connection or activity logs. And there is a 24/7 email support should you run into any problems. One catch though: the service provider will only support the simultaneous connection of a maximum of three devices for individuals and 5 devices for the firm. And as mentioned above, their services cost more than what the competitors charge. On the upside, if dissatisfied by their services, there is a 30-day money-back guarantee. If satisfied, you could opt for the 12-month plan as it offers the best value. Remember that ExpressVPN is working on unblocking access to just about every streaming service including Netflix, BBC iPlayer, Amazon Prime, HBO Now, and Sling TV, among others. Before using it, you might have to disable IPv6 for it to work. This is because Hulu might ask you to use the anonymous proxy when in use because most VPNs do not offer protection against the IPv6 leaks. While VPN connections can route each of your traffic requests via the VPN’s DNS servers while masking IPv4, some of the IPv6 addresses are not masked. So, you need to disable IPv6 when using ExpressVPN. Even though IPv6 is superior to IPv4, disabling it will enhance your online privacy. The VyprVPN is regarded as one of the fastest VPNs around. It has at least 700 servers, and like every other VPN, it encrypts data sent online. One of the unwanted consequences of the encryption is a slowed down internet connection. But this is not the case with VyprVPN. Its speeds are impressive. Regarding security, VyprVPN has all the expected VPN protocols like encryption technology, as well as the company’s own security feature called Chameleon. Chameleon offers some extra layer of protection for you to boot. The unfortunate bit regarding privacy online is that the company records connection times and IP addresses meaning you might want to torrent elsewhere. Besides the speed and security, this VPN also gives you various choices of software. It supports some of the smart TVs, as well as other peripheral devices. The VPN has a VyprVPN Fastest Server option that connects you to the fastest VPN server location that is available. This happens without any tinkering. Also, you get to choose from 8 of the server locations in the US, and one server in Japan. If you are looking for a VPN service provider that offers a balance of price and VPN performance, try Private Internet Access. This VPN service provider offers impressive results, allowing streaming of premium-quality 4k videos. The VPN supports a maximum of 5 devices, and it also works with native apps for Mac, IOS, Android, Linux, and Windows operating systems. It also has extensions for Firefox, Chrome, and Opera. Its high performance comes from its 3160 servers in 52 locations. At least 1450 of these servers are found in 14 locations in the US, and 16 servers are in one location in Japan. Other than the high number of servers, the VPN uses a SOCKS5 proxy. It also has built-in systems for blocking ads and tracking down malicious websites. Private Internet Access does not keep any traffic logs. On the downside, this VPN provider doesn’t offer 24/7 access to its customer support, and there is no free account. The 7-day refund period is also too short. Don’t forget to read our full Private Internet Access review. With its intuitively designed interface which allows for instant streaming, CyberGhost is easily one of the top Hulu VPNs. Its simple profile will unblock Hulu in seconds. CyberGhost boasts over 450 servers located in various locations in the US, 10 servers in Japan and 80 servers in Canada. This means that Hulu is totally within reach when using these VPNs. Besides the extensive location of its servers, CyberGhost’s recent revamping has made it a leading VPN provider when it comes to streaming geoblocked content on the internet. The other impressive feature offered by CyberGhost is its highly intuitive interface that is coupled with premade profiles offering various activities like unblocking Hulu. Since these settings are configured ahead of time, you will not face any problems trying to access Hulu. If you have any trouble with the VPN, just get in contact with the customer support team available 24/7. To add to that, if the VPN fails to impress you, you have a 45-day money back guarantee to cover your loss/disappointment. Don’t forget to read our full CyberGhost VPN review. Ivacy VPN is one of the other reliable VPNs that unblocks Hulu. As of its recent update, you can use this VPN to access Hulu from your desktop browser and on your mobile device. IvacyVPN also works well with Netflix (UK, US, and Australia) as well as Amazon Prime Video. If stuck, get in touch with the company’s live chat on their website. You will also be guided on the servers to select for fast access to that show. Hulu offers high-quality streaming without any buffering. You might also like it because it is inexpensive and easy to use even for novice users. Ivacy VPN works in China too, and it boasts some of the best security systems. You might also like the fact that this VPN allows you to connect at least 5 devices at once on its standard plan. And it comes with apps for IOS, Windows, Mac OS, Android, as well as Amazon Fire TV. Don’t forget to read our full Ivacy VPN review. Torguard VPN is one of the services offered by TorGuard, a US company. Although the rates charges are rather higher than expected, TorGuard VPN traditionally a torrenting VPN is one of the best VPNs for Hulu, thanks to the service provider’s strong interest and emphasis on file sharing. TorGuard runs video streaming, and it has torrenting-optimized servers which offer excellent HD streaming speeds. TorGuard VPN will also allow you to make up to 5 connections simultaneously, per license. ExpressVPN only allows the simultaneous connection of 3 devices and 5 for firms/ corporates. TorGuard ensures the best streaming experience with its big number of bundled servers, over 3000. You might also like the company’s strong security systems, the live chat support, and the no-logs policy. So, if Hulu is restricted in your location, you can use TorGuard to unblock the geoblock. Unblocking Hulu requires that you have a US streaming IP address – this is an extra feature which you have to pay for on top of your subscription. The streaming IP will give you access to Hulu. TorGuard VPN allows you access to Hulu thanks to its US-streaming IP feature which optimizes the servers. It also allows P2P-sharing, and it offers streaming-based subscriptions. Now, you should not be fooled into assuming that Hulu looks the other way when it comes to the use of VPNs or proxies just because it’s less popular than Netflix. Hulu has very strict regulations regarding the use of proxies to access its network. Also, Hulu’s ban runs on quite advanced systems than the Netflix firewall. So, when choosing a VPN, you need to make sure that the VPN has a high number of servers in the US making it look as though you are accessing Hulu from the US. So, how do you pick the best VPN for Hulu? For starters, you need a VPN with several servers located in the US or Japan. The availability of servers helps you find a reliable connection. Also, quite naturally, the selected VPN should be fast enough to allow you to stream HD content. At the same time, the VPN must-have apps for different platforms and devices – this is important if you wish to stream Hulu on different devices. Security is also critical, and you must confirm that the VPN provider offers excellent customer support. Note, however, that most of the VPNs reviewed above will ensure your access to Hulu, as uninterruptedly as possible. Having identified the server to connect to. Subscribe, sign up and then download your preferred VPN from the list above. Run your VPN app and select your server location to unblock Hulu. If you are unsure, seek help from the customer support or look for the information on the website. Finally, open Hulu in your preferred web browser or even the Hulu app and start streaming. So, there you have it – the top recommended VPNs for Hulu. Just keep in mind that the VPN you use should be secure, fast for HD streaming, easy to use, and with access to a reliable customer support service.